News recently emerged that Russia was banning key Islamic scriptures—including Sahih Bukhari—on the charge that they promote "exclusivity [supremacism] of one of the world's religions," namely Islam; or, in the words of a senior assistant to the prosecutor of Tatarstan Ruslan Galliev, "a militant Islam" which "arouses ethnic, religious enmity." If Sahih Bukhari, a nine-volume hadith collection compiled in the 9th century and seen by Sunni Muslims as second in importance only to the Koran itself is being banned for inciting hostility, where does that leave the Koran? "I will cast terror into the hearts of the unbelievers, so strike [them] upon the necks [behead them] and strike from them every fingertip'" (8:12). "Fight those among the People of the Book [Christians and Jews] who do not believe in Allah nor the Last Day, who do not forbid what Allah and His Messenger have forbidden, and who do not embrace the religion of truth [Islam], until they pay the jizya with willing submissiveness and feel themselves utterly subdued" (9:29). "Then, when the sacred months have passed, slay the idolaters wherever you find them—seize them, besiege them, and make ready to ambush them!" (9:5). "Fighting has been enjoined upon you [Muslims] while it is hateful to you" (2:216). That Islam's core texts incite violence and intolerance has many ramifications, for those willing to go down this path of logic. For example, as I argued more fully here, although Muslims around the world, especially in the guise of the 57-member state Organization of Islamic Cooperation (OIC), continue to push for the enforcement of "religious defamation" laws in the international arena, one great irony is lost, especially on Muslims: if such laws would ban movies and cartoons that defame Islam, they would also, by logical extension, need to ban the religion of Islam itself—the only religion whose core texts actively defame other religions. Consider what the word "defamation" means: "to blacken another's reputation" and "false or unjustified injury of the good reputation of another, as by slander or libel," are typical dictionary definitions. What, then, do we do with Islam's core religious texts—not just Sahih Bukhari but the Koran itself, which slanders, denigrates and blackens the reputation of other religions? Consider Christianity alone: Koran 5:73 declares that "Infidels are they who say God [or "Allah"] is one of three," a reference to the Christian Trinity; Koran 5:72 says "Infidels are they who say God is the Christ, [Jesus] son of Mary"; and Koran 9:30 complains that "the Christians say the Christ is the son of God … may Allah's curse be upon them!" The argument that some Islamic books should be banned on grounds that they incite segregation and violence is applicable to the Koran itself, which unequivocally defames and creates hostility for unbelievers. Surely such verses defame the Christian religion and its central tenets—not to mention create hostility towards its practitioners. In short, the argument that some Islamic books should be banned on grounds that they incite segregation and violence is applicable to the Koran itself, which unequivocally defames and creates hostility for unbelievers, that is, non-Muslims. That said, in the "real world" (as it currently stands), the very idea of banning the Koran—believed by over a billion people to be the unalterable word of God—must seem inconceivable. For starters, whenever Muslims are pressed about the violent verses in the Koran, they often take refuge in the argument that other scriptures of other religions are also replete with calls to violence and intolerance—so why single out the Koran? To prove this, Muslim apologists almost always point to the Hebrew Scriptures, more widely known as the "Old Testament." And in fact, the Old Testament is replete with violence and intolerance—all prompted by the Judeo-Christian God. The difference between the violent passages in the Koran and those in the Old Testament (as more comprehensively explained here) is this: the Old Testament is clearly describing historic episodes whereas the Koran, while also developed within a historical context, uses generic, open-ended language that transcends time and space, inciting believers to attack and slay nonbelievers today no less than yesterday. Thus in the Old Testament God commands the Hebrews to fight and kill "Hittites," "Amorites," "Canaanites," "Perizzites," "Hivites," and "Jebusites"—all specific peoples rooted to a specific time and place; all specific peoples that have not existed for millennia. At no time did God give an open-ended command for the Hebrews, and by extension their Jewish descendants, to fight and kill all "unbelievers." To be sure, Muslims argue that the verses of the Koran also deal with temporal, historical opponents, including the polytheists of Mecca, and to a lesser extent, the Byzantine and Sassanian empires. The problem, however, is that rarely if ever does the Koran specify who its antagonists are the way the Old Testament does. 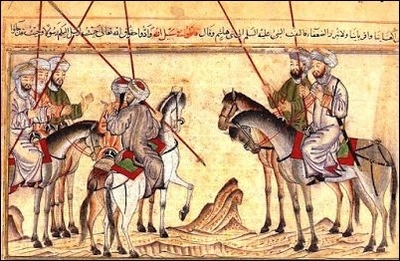 Instead, Muslims were (and are) commanded to fight the "People of the Book," which Islamic exegesis interprets as people with scriptures, namely, Christians and Jews—"until they pay the jizya with willing submissiveness and feel themselves utterly subdued" (9:29) and to "slay the idolaters wherever you find them" (9:5). The salient feature of almost all of the violent commandments in Islamic scriptures is their open-ended and generic nature. The two Arabic conjunctions "until" (hata) and "wherever" (haythu) demonstrate the perpetual and ubiquitous nature of these commandments: There are still "People of the Book" who have yet to "feel themselves utterly subdued" (especially all throughout the Americas, Europe, and Israel) and "idolaters" to be slain "wherever" one looks (especially Asia and sub-Saharan Africa). In fact, the salient feature of almost all of the violent commandments in Islamic scriptures is their open-ended and generic nature: "Fight them until there is no more chaos and [all] religion belongs to Allah" (Koran 8:39). This fact will ensure that as long as the Koran proliferates and is read as God's literal word, its readers will continue to exist in a dichotomized world, themselves versus the rest.